When arriving at the airport by taxi for your outgoing connection you’ll be dropped off by the main Departures Hall, which is on the upper level of the airport building. There is no problem when you rent a car at the airport, because some companies leave you at the departures terminal. The suburban train service is also an interesting choice, the new train station is inside the terminal 3. You should check-in at the desks as you enter the Departures Hall in Terminal 3, and all check-ins can be processed here. There are also some check-in desks in Terminal 2. There are the usual amenities available once inside the departure lounges; duty free shopping, restaurants and snack bars, gift shops, a chemists and a post office, internet access points, as well as two VIP lounges in Terminal 2. Once your flight has been allocated a departure gate, passengers will be asked to make their way to a pre-departure ‘pier’ or ‘bay’ – where the gates are situated. Access to both bays is from the lounge, with Bay B on the left and Bay C on the right. Usually flights to the UK will start from Bay / Pier C, but this is not always the case so check the information screens in the departure lounge. For passengers with special needs Malaga airport provides ‘Green Jackets‘ – customer service agents who will assist up to check-in time, when the airline will take over. Wheelchairs will be requested at check-in. 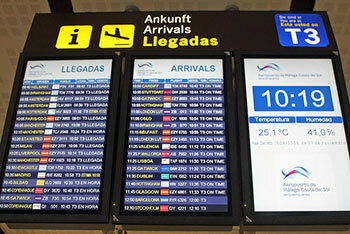 You can use the live departures information provided by AENA to get up-to-the-minute departures information. You can find out about flight details either by entering the flight number in the left-hand panel, or by selecting the correct airport & airline information in the drop-down menus on the right-hand panel. You can also call the airport for departures information, although during high season you’re likely to find it continuously engaged. The telephone number is: 0034 952 048 838.